The battle has begun. Yard signs are popping up- but, most of them aren’t in yards so far, they are in the right of way, on public property- or even in vacant lots. The signs are placed by overzealous campaign workers working for campaigns with lots of money. Signs aren’t cheap- I just got David Greer 250 and the bill was around $675, these are the cardboard, fold over type. A yard sign doesn’t tell you anything about the candidate- other than their name, what they are running for. It’s not like a website, or a voters guide. Supposedly, the display of a yard sign means that a voter thinks they will be best represented by that candidate. 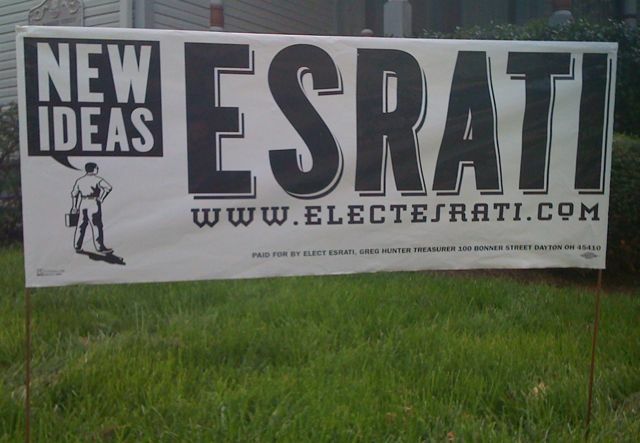 The reality is- not that many voters are that tuned into local elections that they actually say- I want one of those Esrati signs, I’m going to have to go find one. I’ve always prided myself of only putting my signs in yards- and that I’ve gone and asked the voter if it’s ok. Some say yes, without knowing much about me. Some ask questions and then make up their minds. And then some say no. If given a choice, I’d much rather have them read my literature, or this site- and then tell their friends, than have them put a sign in their yard. But, it’s even better if they do both. 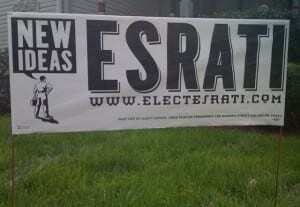 My signs say “New Ideas” on them- and it’s a statement of fact- I represent new ideas. Read the other signs- they say nothing. Is this the level of political discourse we should be having? This season, despite having a primary for mayor and commission- something that hasn’t happened for 20 years, we’ve had the fewest requests for candidates’ nights. I think it’s because of the disgust people have for the politicians in D.C. that there isn’t as much interest locally. We’ve got a commission event this Monday at the Kroc Center- McCook Field Neighborhood is sponsoring, no mayoral candidates Monday, April 8, 2013 at 6:30 p.m. in Exhibit Hall Room A of the Ray & Joan Kroc Corps Community Center at 1000 N. Keowee St. And Tuesday, the Stonewall Democrats is having a taping at DATV from 6:30 to 8:30 for broadcast on local cable. That’s it. Haven’t heard from the League of Women Voters, nor have the candidates worked together to create an event. The American Institute of Architects is talking about an event AFTER the primary at the Engineers Club, but that’s it. I’d like to see a Pecha Kucha night for all the candidates- PK is 20 powerpoint slides, 20 seconds each- on autopilot. Both Mayor Leitzell, Joey Lutz, and I have participated in past events. Each candidate can make their pitch on “Why me” and a moderator selects questions from the audience- that are handled in an organized fashion- with all candidates getting equal time to answer. The Dayton Independents- Greer, Leitzell and Esrati (me) have all been doing video interviews with the Dayton Informer and posting them at www.IndependentDayton.com to try to show how three candidates can work together- and to make sure that we have done all we can to inform the voters since we won’t have a $100,000 budget for mailings, tv spots, radio. Next Post: An alternative to eye in the sky- eyes on cops? GO, DAVE, GO! GIVE ‘EM H#LL!! !